Nothing major to do today. We went up to 42nd Street to get a small carry-on suitcase - a long way, but a good price for a Sansomite. 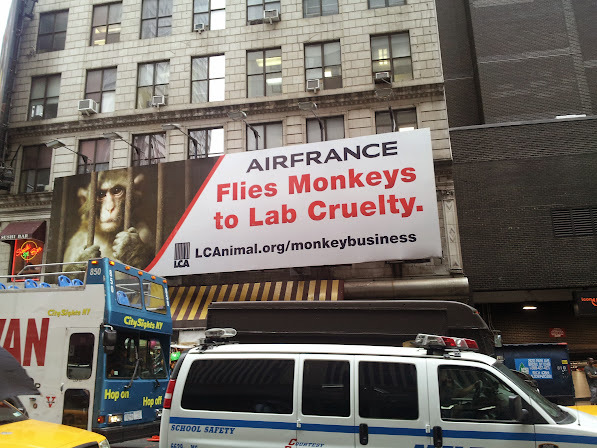 On the way I noticed Air France is getting some bad publicity - a banner castigating them for transporting research monkeys. 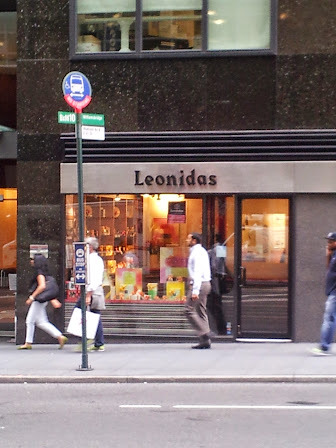 From there we went to Leonidas Chocolates in Madison Avenue, an outlet for the famous Brussels chocolatier. I was after a particular truffle, the Perle Pistache, which I used to buy from the little shop in Trinity Arcade. 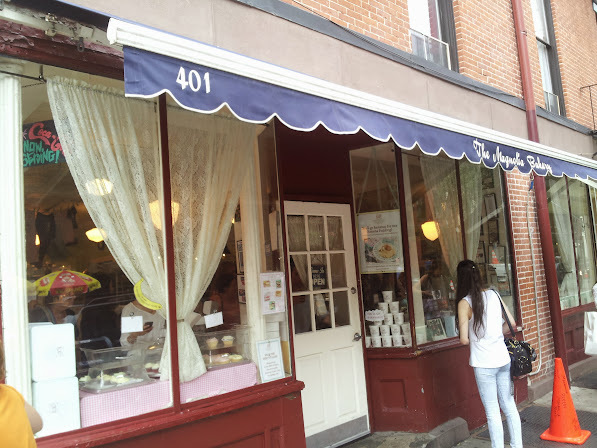 Unfortunately they didn't do that, or indeed any of the "perle" truffles. I hope they're not extinct. The ones on their website aren't green-tinged. However, there were some pistachio chocs for sale, and I picked up some others for Ron (later ron). 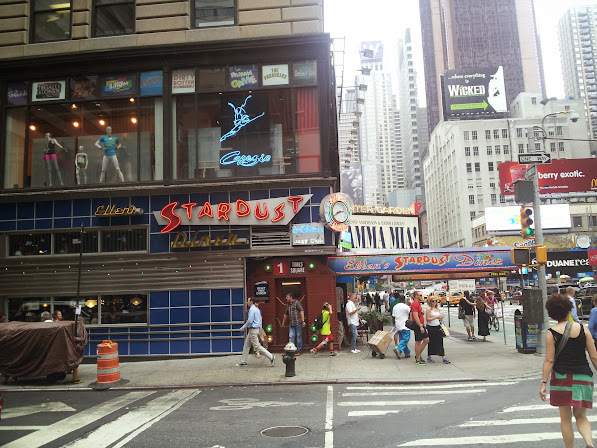 Once more through Times Square to the subway station. Lynda went to 23rd Street to try to get her hair done, but the hairdresser she wanted can't do it until Sunday. Instead, she went shopping for friends and family. After that we walked around the corner to Magnolia Bakery for cupcakes (not much of a queue, yar mo) and a peek inside a cards and curiosities shop. 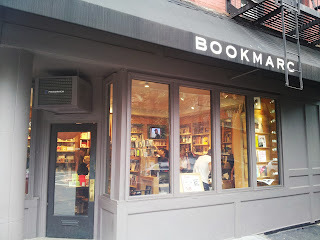 I'd hoped the Bookmarc bookshop would have some avant-garde books but the selection wasn't very good. 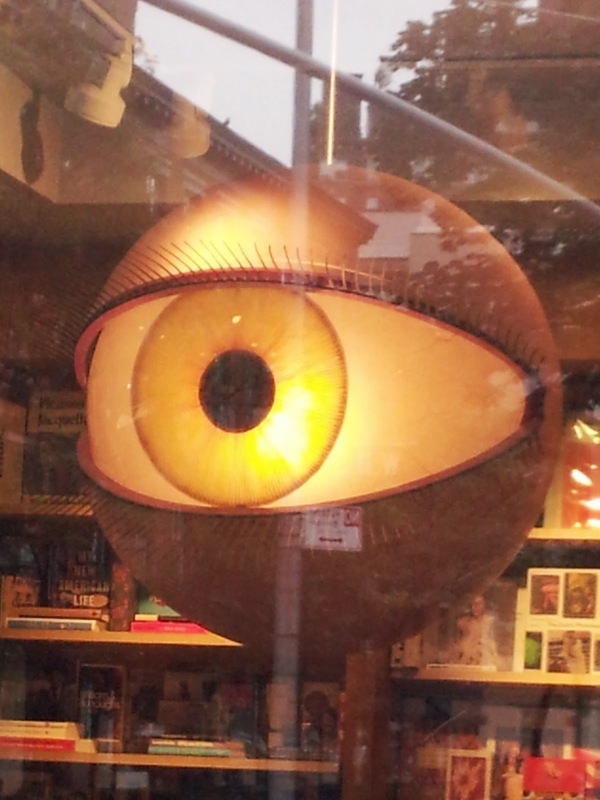 There was a big winking eye though. 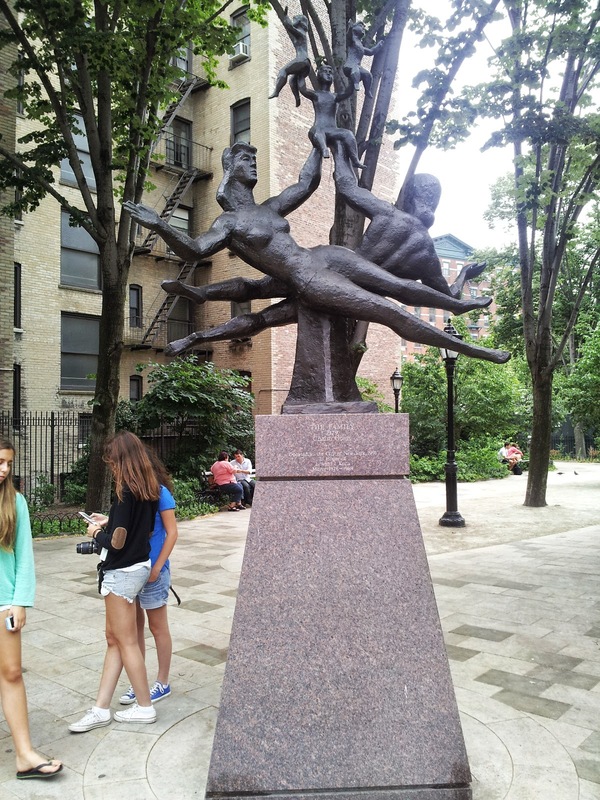 Across the road was a nice statue commemorating family. Lynda bought some tobacco for her son, and the Indian shop owner was delighted to have an Australian couple to chat about the Test Cricket, and how we all like Ashton Agar. We went to a different wine shop for a change and another cheap bordeaux - a 2006 vintage for $19.99. The Australian wines were much more expensive, and not just the premium brands. We've picked up a local guide to quirky shops in the West Village, so that'll probably do us for tomorrow. Tonight we're dining at Piccolo Angelo, a hot tip from the apartment owners and said to be the best Italian food in NYC.